The Herschel Trio’s debut disc celebrates the music of Georg Phillip Telemann, and commemorates the 250th anniversary of Telemann’s death in 1767. Telemann wrote in his autobiography that his method of composing trios involved making the second part just as important as the first, with the bass having a natural melody and harmony closely associated with the two treble parts so that every note could not be any other note than the one it was. He observed that people would often compliment him on his trios, saying they were his “special forté”. The trios in this recording, works characterised both by the composer’s eloquence and exuberance, demonstrate his special affinity both with the trio form and with the instruments for which they were composed – flute, viola gamba and harpsichord - all instruments he himself played. 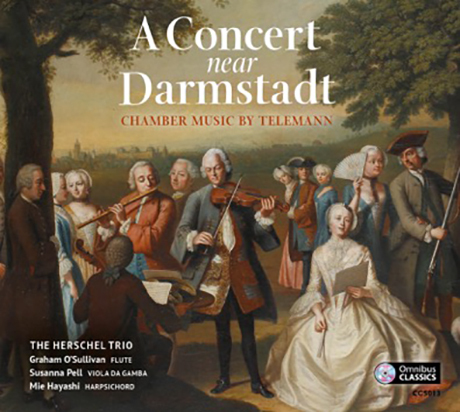 The title of the disc ‘A Concert near Darmstadt’ is inspired by in a mid-eighteenth century painting by the German artist Johann Christian Fiedler, which adorns the cover of the disc and which is handsomely reproduced within the accompanying booklet. Georg PhillipTelemann Trio in F; Suite in D Minor, Trio in A Minor; Concerto in A Major; Trio in B Minor; Concerti in D Major; Trio in G Minor.